In this week's haftorah, Yechezkiel prophesies about the various laws pertaining to the kohanim (priests). This corresponds to Parashat Emor, where Moshe explains the rules of the kohanim. These parallel teachings emphasize the idea of continuity from the time of the Torah to the later prophets. Yechezkiel gives us a glimpse of the status of the kohanim who will serve during the messianic era, in the third Temple, may it be built soon! The prophet explains the role of the kohanim as teachers and spiritual leaders. They do not receive a portion in the Land of Israel, but instead are nourished by the sacrifices and various tithes. The kohanim must wear special garments, and are commanded to keep their hair cut neatly. They have special purity requirements, which preclude them from coming in contact with a corpse, unless it is the body of a member of their immediate family. They are prohibited from marrying women who are divorced or widowed (unless the widow was originally married to a Kohen), and they may not drink wine prior to, or during their service. A careful reading of the haftorah reveals that the regulations of the ordinary kohen are similar to the status of the kohen gadol described in the parashah. This is because all existence will be elevated during the period of redemption. For example Verse 44:22 in the haftorah prohibits the ordinary kohen from marrying a widow, unless she is the widow of a kohen. The parashah permits all widows as marriage partners for the ordinary kohen, reserving that prohibition for the Kohen Gadol alone. Just as in the time of Mashiach the holiness of the kohanim will be upgraded, so will the status of the Jewish people be raised as Rambam explains, "…there will be no jealousy or quarreling.... the preoccupation of all will be 'to know Hashem'...the Jewish people will be great scholars who will understand Hashem to maximum human capacity." (Rambam, Hilchot Melachim 12:5). Together with every sector of reality, the status of women will also be elevated then, when the light of the moon will grow full to reflect the light of the sun (Yesha'yahu 30:26). ... "You shall also give to the Kohen the first of your dough, that he may cause a blessing to rest on your home" (Yechezkiel 44:30). From this verse, the Zohar learns that a person who dwells without a wife dwells without a blessing (Zohar Chadash, Parashat Chukat, the Song of the Well). The Talmud states, "One should be dedicated to separating challah, and remind his wife about this mitzvah on the eve of Shabbat, for it is one of the great rectifications for the sin of the first woman. She extinguished the light of the first man and caused death to him, who was the challah of the world. Therefore, she was given the mitzvah of lighting the Shabbat candles and offering the challah to the kohen" (Talmud Yerushalmi Shabbat 20a). Although challah is taken any time there is a sufficient amount of dough, separating challah is mainly performed on the eve of Shabbat, since the sin took place on the eve of Shabbat, and rectifications are best enacted during the time-frame of the original wrongdoing. יהי רצון מלפניך ה' אלוקי ואלוקי אבותי שבכח סגולת הפרשת חלה יתוקן עון אם כל חי, חוה, שהביאה מיתה על אדם הראשון שהיה חלתו של עולם. ובכן בכח סגולת זכות מצות הפרשת חלה, "בלע המות לנצח ומחה ה' אלקים דמעה מעל כל פנים" ולהניח ברכה אל בתינו. יהי רצון שתבורך עיסתנו על ידינו כמו ששרתה ברכה על ידי שרה ורבקה רחל ולאה אמותינו, יקויים בנו מקרא שכתוב ראשית עריסותיכם תתנו לכהן להניח ברכה אל ביתך. 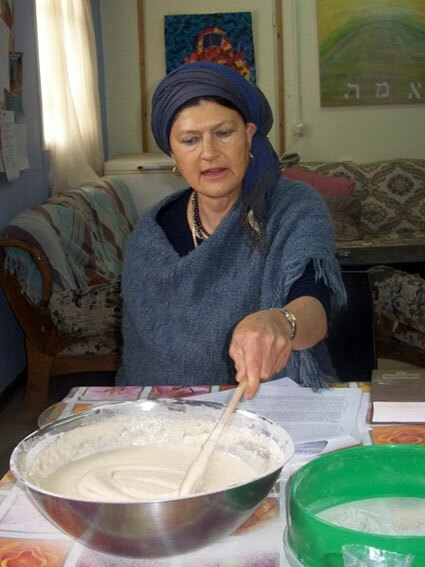 "May it be Your will Hashem, my G-d and the G-d of my fathers, that through the spiritual power of separating challah, the sin of Chava, the Mother of All Life, will be rectified. She brought mortality to Adam who was the challah of the world. Likewise, through the spiritual power and merit of the mitzvah of separating challah, "May death be swallowed up forever, and Hashem wipe away the tears from off all faces," "and cause a blessing to rest on our home." May it be Your will that our dough will be blessed through us like the blessing that dwelled through Sarah, Rivkah, Rachel and Leah, our Mothers. May it be established through the Scriptural verse ..."You shall also give to the Kohen the first of your dough that he may cause a blessing to rest on your home" (Yechezkiel 44:30), (Chemdat Yamim, Shabbat Kodesh, Chapter 2). When we offer up the first of our challah-dough to Hashem, the rest of our bread becomes as if left over from our offering, which is the Holiest of Holy. We are sustained not only by the physical bread, but rather by the holiness which Hashem's puts in our food. "Humanity does not live by bread alone, but by every word that comes out of the mouth of Hashem, does humanity live" (Devarim 8:3). The reason why the challah gift to the kohen causes the blessing to dwell is because it causes more holiness of Hashem's mouth to reside within our food. This extra holiness in the food strengthens our heart and helps us to do teshuva. When we bake bread, all the scattered flour becomes unified into one lump. Separating the first of our dough as a gift to the kohen, is therefore, a rectification for the lack of unity among the Jewish people. This explains why the gift of "the first of your dough… causes a blessing to rest on your home". For the blessing is enacted by means of unity. One of my Shabbat guests, Bracha Lappen, shared with us that she began to connect with her Hebrew name, only after she had learned that the word bracha (blessing) shares the root of the Hebrew word for "knee" (berech), which means connection. Therefore, taking challah connects us to one another, and brings blessings to our home and the entire world by rectifying senseless hatred and schism between us (Shem m'Shemuel, Parashat Korach, year 5674, Parashat Shelach, year 5677, and 5672). Please share your thoughts and experiences in bringing more holiness into our food!